The problem in America is that there are two classes of people. Those above the law and those forced to obey. Los Angeles Superior Court Judge James Bascue is a good example of this. He should have been shot dead as are thousand of Americans each year by police, however he’s given every benefit and option, which is what every American deserves. Los Angeles Police arrested a retired judge on Thursday after the man opened fire at officers responding to his 911 call. L.A Superior Court Judge James Bascue, who is now in his 70s, was taken into custody after he allegedly fired two shots in the direction of police. He is being booked on the suspicion of assault with a deadly weapon. He is also being examined by officials to see if substance abuse or mental health played a role. You have to love the fact that all these “Above the law” folks are “public servants” however not one of them acts as a servant. That definition must be changed as it does not fit the role these people perform, they almost all act and are above the law. Noting like a servant should be. 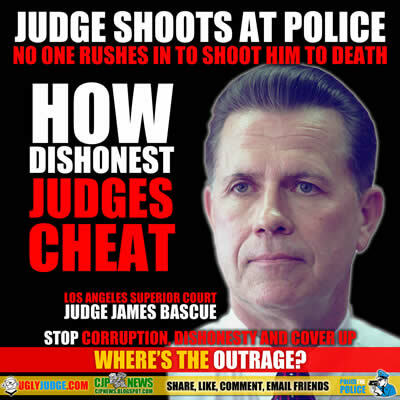 Los Angeles Superior Court judge James Bascue pleaded no contest today to a single count of assault with a firearm for firing a shot at police officers during a standoff at his West Los Angeles home and was sentenced to 500 hours of community service and five years of formal probation. The case against Judge James Bascue, 75, was being handled in Orange County because all of the judges in Los Angeles County had to recuse themselves. Bascue left the Los Angeles Superior Court bench about eight years ago. The case was prosecuted by the state Attorney General’s Office. Orange County Superior Court Judge Thomas Goethals, who presided over the case, ordered James Bascue to continue wearing a bracelet for another year that records if the defendant has had any alcohol or drugs and to get rid of his guns, which he already has done. If Bascue fails to complete his community service or violates any terms of his probation he could face up to four years in prison. He is due back in court July 8 for a “progress report” hearing from probation officials. Goethals said he decided against ordering Bascue to do time behind bars because he deserves credit for his extensive background as a public servant, which also might make the defendant vulnerable to the “many enemies” he might have accrued over the years as a law enforcement authority. Goethals, however, was mindful of the “perception” that Bascue might be getting a break because of his standing in the legal community. “It’s important to me and this community there not be a perception we have a two-tiered system of justice,” Goethals said. Goethals made a point of addressing Bascue with the title of “mister” instead of judge so as not to indicate special “deference” to the defendant. Goethals referred to Bascue’s “unbreakable chain of high level of service” in his career in law enforcement. That, however, should not “lessen the seriousness of what happened in your home last June,” Goethals said. Goethals did not refer to retired Los Angeles Superior Court Judge Lance Ito by name, but he dropped enough hints to make it clear he was referring to the judge who presided over the “trial of the century,” as the source of one of the more compelling letters of support for Bascue.